Tropical storm Harvey is currently ravaging the coast of Texas, with torrential rains and floods putting countless numbers of people in danger. At least five people have lost their lives and thousands more their homes and possessions. In the wake of Hurricane Harvey, the US Coast Guard is warning frantic Texans not to turn to social media for help. Countless thousands have taken to social media to beg for help from rescue workers. Just visiting the Facebook Safety Check page, in fact, leads you to dozens of people listing addresses of stranded friends and family members. But according to the US Coast Guard, emergency services numbers offer far better support than a quick tweet or Facebook message. Granted, it’s probably not wise to tweet your personal details in a public forum no matter the circumstances. And rescue workers are going to give more priority to their phone lines than to social media. To use social media is also to be vulnerable to fake news. We’re already seeing a number of fake emergency numbers and hoax photos from previous disasters. The misinformation could lead to loss of human life as legitimate postings could go unseen while fake ones are proliferated across all social media networks. That said, several people have managed to use social media to their advantage. Major figures in the rescue efforts, such as Chief of Police Art Acevedo and the city’s Office of Emergency Management have been using Twitter to coordinate rescue efforts and get word out to a broader audience. In one case, residents of an assisted living home in the area were rescued after a photo of them chest-deep flood water went viral. According to the daughter of the building’s owner, they were told they would be put on a list for rescue, but first responders couldn’t reach them. She tweeted the photos in desperation, believing her mother and the residents would not be helped at all. And it worked: the facility was evacuated the same afternoon. 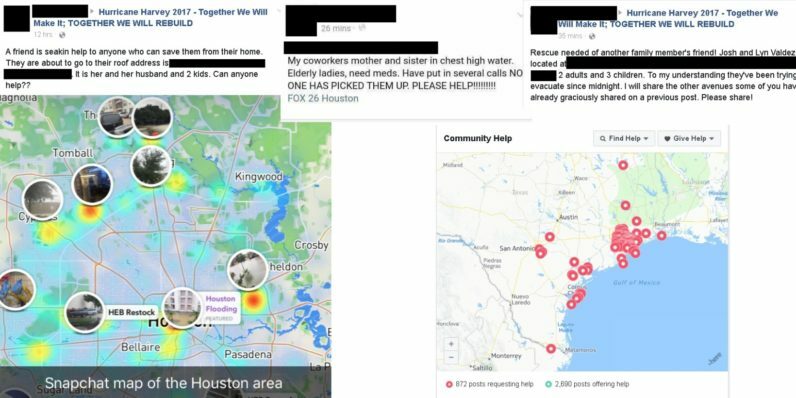 For the residents of coastal Texas, social media gives a secondary channel for those in dire situations. It can’t and shouldn’t replace emergency lines, but it gives them another way to be heard.